José dangled the bag of pungent guavas right in her face. As if that wasn’t enough, he mocked her, making fake vomiting sounds. She ran upstairs and locked her bedroom door to escape the torture–her first mistake. After more than 20 years of experience, you’d think she’d learn to just roll over at the first hint of his big-brother shenanigans, ­but she always falls prey. Sometimes I’m convinced that the worse you get teased or tortured, the more he loves you. But that’s not where it stopped. He decided to wait a day to both allow his sister to forget about the guavas and to allow them to ripen further to a rather stinky state. He waited until she wasn’t home and he hid several of them around her bedroom. Some were easy to find but others so impossible that no amount of looking on her part was going to yield treasure. When she returned home and entered her room, she could almost immediately sense the smell. She hadn’t quite figured out how it got there until she came out of her room and saw José smirking. “¡Mamá!” she yelled — as if calling for my suegra’s help was going to solve the case — her second mistake. As she began searching her room trying to figure out where the smell was coming from, she held a towel over her nose and mouth as if the smell was toxic. One under the bed. One in a pillowcase. She began to wretch. One behind a picture frame in her bookcase. By now, my suegra was helping with the search. They found another and another. Finally, José relented and removed the remaining guavas — some from the closet and some from a chest of drawers in her adjacent bathroom. We all had a good laugh, hugs were exchanged, and the torture was forgotten. Ever since then, guayaba jokes have been made at my cuñada’s expense any time they’re brought into the house. But she’s always been a good sport about it. Lately, there’s been an abundance of good-looking guavas at my local market and I felt compelled to take some home and create something delicious with them. Lucky for me, no amount of torture by guayaba will send me running. This recipe is adapted from one of my favorite Spanish-language cookbooks that I purchased in Mexico, Las Fiestas de Frida y Diego: Recuerdos y Recetas. It’s a beautifully written cookbook that has both recipes and the family history behind them. The book contains recipes from the cocina de la Casa Azul of Frida Kahlo and Diego Rivera and the book is co-written by Rivera’s daughter, Guadalupe. 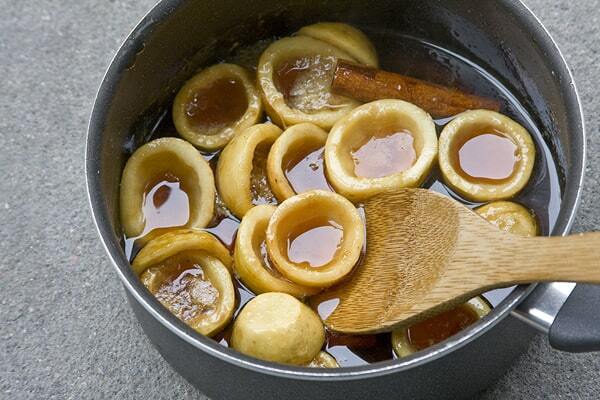 This recipe is also often known as guayabas en almíbar in Spanish. This dessert pairs well with a cup of hot coffee. 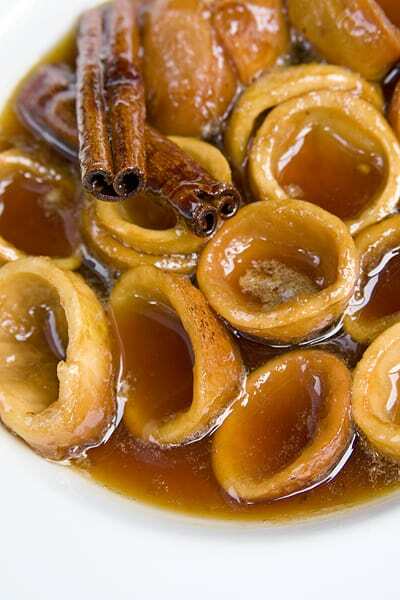 This traditional Mexican dessert of guavas in a cinnamon and piloncillo syrup is known in Spanish as guayabas en sancocho or guayabas en almíbar. 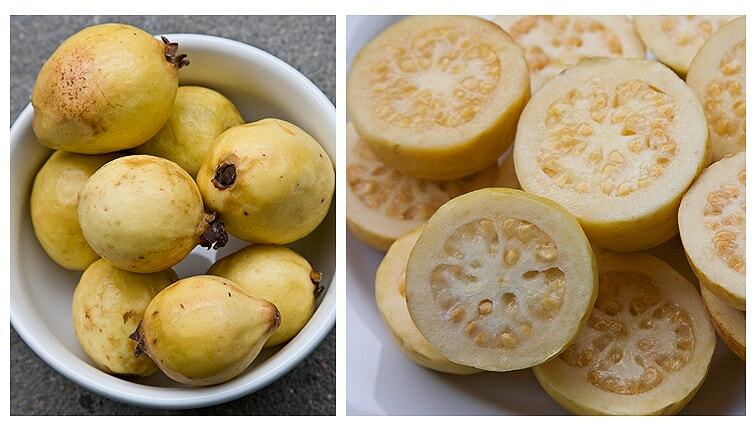 Cut the ends off the guavas, halve them and then remove and discard the seeds. Set aside. Using a sharp knife, cut the piloncillo into pieces. The cones are usually packed very tight and are difficult to cut, so take care with the knife. 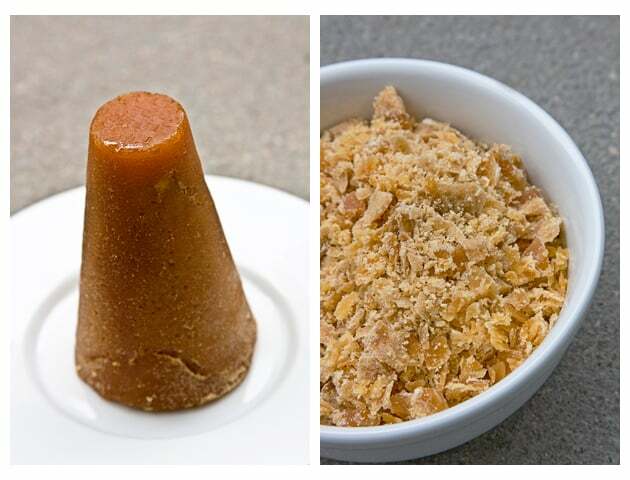 Heat the water, piloncillo and cinnamon sticks over medium heat in a saucepan until the piloncillo is completely dissolved and the syrup begins to boil. Add the guavas to the syrup. If necessary, add a little water to the syrup if it is too thick, two tablespoons at a time. Allow the syrup to simmer until the guavas are soft and the syrup is thick. In Singapore, we eat a larger version than the Mexican one, and the rind is green. We eat it primarily as a fruit, so it’s not often cooked. The difference is, it’s usually sliced up and sprinkled with a powder grinded from salted, dried plums. Very, very refreshing and delicious. My mom has a guayaba tree, it makes hundreds of fruit. My kids will just pick from the tree (the baby from the floor( : ) and start eating. I myself am not so fond of eating the fruit by itself but my mom makes the yummiest jalea, that tastes so good on toast with coffee. I had to smile as I was reading, I could picture your cunada, looking around her room with a towel over her head! and we are never too old to scream for Mama. came across your other post over at Spanglishbaby! I don’t like Guayabas but I LOOOOOVE their smell, isn’t that funny? I think my husband would love this recipe, I’ll try it! @Desiree Wow, that sounds delicious. I’d love to see a photo of what it looks like prepared. @Marcela That’s great your kids love guayabas! I love jalea de guayaba and am trying to learn how to make my own, so stay tuned for a future post on that when I finally develop a good recipe for sharing. @Mary The smell is so intoxicating, isn’t it? Some people don’t like eating guayaba because of the skin. Try peeling the skin off and see if that changes anything for you. I’ve had some people tell me they leave the seeds in as well, but I personally do not because I once almost chipped a tooth on a seed and I’ve taken them out ever since. Although sometimes I leave the seeds in just for the cooking process (for instance, check out my ponche navideño recipe) because the seeds provide some of the same flavor that we love about the smell of the fruit in general. Yay, now I know what to do! I have a tree but the flesh is pink (also with hundreds of hard tiny seeds). We usually eat a handful during the its season and the rest are given away. I could probably put them Mason jars using this recipe. How long will it store in the fridge? Hi Catalina, I’m not positive the kind of guavas you have will taste the same with this recipe since it calls for the white-flesh guavas. But if you give it a shot, it should keep in the fridge for up to two weeks (if it even lasts that long!). Having grown up in the US, this is not a fruit I am familiar with, but the first time I smelled it in my in-laws home I tracked it down and had to have one. They taste pretty good, but the smell is intoxicating! Gracias ,I am going to try these too. I made Peras en Almibar for my husband on Thanksgiving!